Tuesday To Do List is my newest attempt at bringing you tidbits from the gluten-free world each week. This will continue until my mind-that-doesn’t-rest comes up with another way to entertain you guys. You can read my very first to-do list here. Cross your fingers I am back here next Tuesday with another list. Our Badgers won in the very last second the other night on the court, sending them to the Sweet 16… but the REAL March Madness is March MUFFIN Madness happening right now with “coach” Shirley. 😉 Go check out ALL of the recipes (and oh-so-generous prizes!!!) 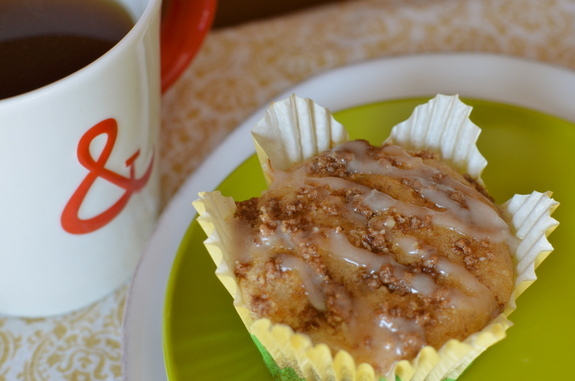 and then try out my coffee cake muffins I entered in the madness last year. I also may try to save a little for these gluten-free onion rings! We are trying out 225 South/Mia Famiglia’s new location in Waukesha tomorrow night for our GF Get Together dinner — friends on Facebook have been raving about the plentiful options for the GF crowd and their careful handling/separate prep area to avoid cross contamination. For once in my life, I was thankful for a delay during my layover — it meant sit down dinner at Root Down in the Denver airport! You must try when you’re passing through Concourse C. (actually ALL of the restaurants in their group: Root Down, Linger, and Ophelia’s have gluten-free options and I’ve eaten at ALL of them safely. 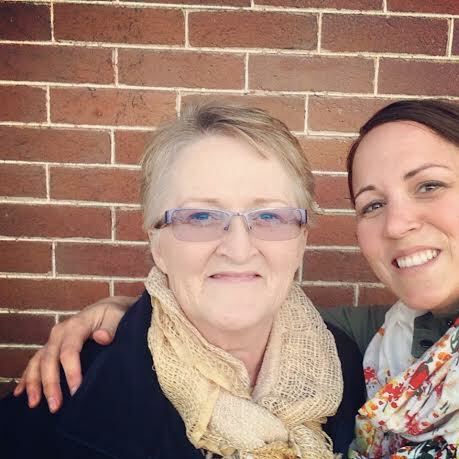 Looks like my dear friend Johnna love Root Down as well, read about her experience here. Another EVERYthing is gluten-free bakery/restaurant find, this time in Tucson, AZ. We are headed back this fall to celebrate my brother’s retirement from the Air Force (SO proud of him!) and will be going back to Gourmet Girls Gluten Free Bakery & Bistro. After being in summer-like weather all week in Arizona, I had a severe vacation hangover returning to chilly Wisconsin weather. Dreaming of real spring temps… maybe these Springtime Lemon Bars would help? Give me all the lemon desserts — next up is this naturally GF meyer lemon creme brûlée ! I created this recipe for the March Muffin Madness event with Shirley over at Gluten Free Easily — do yourself a favor and pin the final post with ALL of the muffin recipes from the month. And now I’m sharing it with you here. Go make them for your mama this Mother’s Day weekend — if she is anything like my Mamasita, I bet you count your blessings daily. And for all those women we know who would give anything to be a mama — the ones who dread Sunday with their whole being but somehow find the strength to get out of bed, face the world, put one brave foot in front of the other and celebrate the mamas in their lives that they look up to, are inspired by, and hope to be just like one day … these muffins, a coffee date with head tilting laughter, and just a little “I’m here. I love you.” message could mean the world. Happy Mother’s Day — let’s celebrate all of the women in our lives who deserve a little sweetness! Preheat oven to 350 degrees. Line muffin pan with liners and set aside. In a large bowl, whisk together the dry ingredients: flour mix, cinnamon, baking soda, baking powder and guar gum. Add Greek yogurt, oil, egg, maple syrup, and vanilla and stir until well combined. Fill liners ⅔ with batter, then top each muffin with a spoonful of topping. There will be enough topping to generously cover the tops of the muffins. Press down lightly on the topping to ensure even coating when they rise while baking. Bake at 350 for 18-21 minutes. Allow to cool a few minutes before removing from pan, then transfer to wire rack to cool completely. 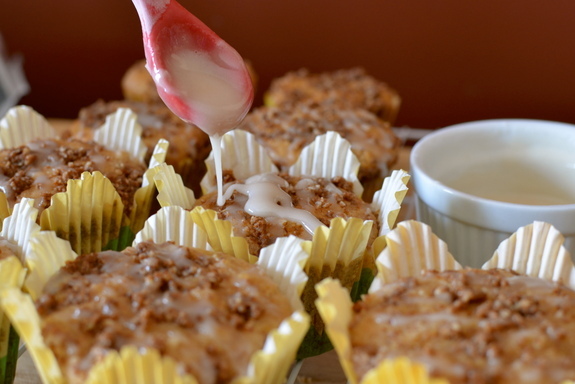 While the muffins are cooling, prepare the glaze if you choose to use it. (You should!) In a small bowl, combine powdered sugar and cinnamon, and add a few drops of vanilla. Slowly add a small amount of water/milk at a time to get the consistency of a good glaze. Drizzle glaze over muffin tops. Makes 12-15 muffins. These muffins are perfect warm out of the oven, but give them a little time to cool before adding the glaze. For the next morning you can just warm them slightly to enjoy them coffeehouse style. Be sure to check the flour mix you are using – some GF flour mixes have baking soda, baking powder, or xanthan/guar gum included already. If your mix already has those ingredients, you do not need to add them again for the recipe. The guar gum is not required if you cannot tolerate gums. 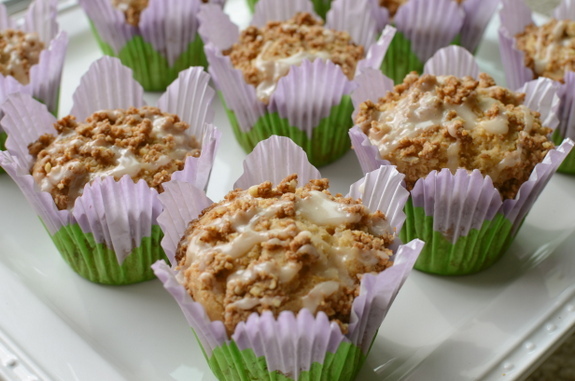 I have made these muffins with and without gums and have been happy with both results. Baking time may vary depending on the size of muffin liners you use and how full you fill them. I like to use these larger flower liners, which make 12 larger muffins and take a bit longer to bake. For those who are dairy free, you can use a dairy-free butter substitute for the streusel topping or coconut oil will work as well. For the Greek yogurt, you could substitute dairy free yogurt, either plain or vanilla. For the gluten-free flour mix, I’ve used Pamela’s, Mama’s Almond Flour Blend, and Cup4Cup, as well as a mixture of my own all with success.